We all have noticed now or then that it becomes more difficult to maintain healthy skin during harsh winter months. Cold weather conditions create some serious challenges, especially for blemish-prone or dry skin. 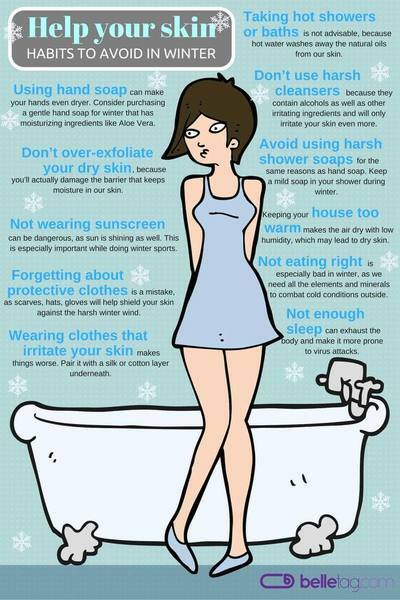 Even if your skin is perfectly healthy and fine else when, when winter comes it seems it’s just not ready to handle it. Winter comes with cold and less humidity in the air. To combat the cold, we have to turn up the central heating in our homes and offices. This, in turn, dry the air even more. Dry air with low humidity may lead to dry skin, not to mention other serious issues such as irritated sinuses and throat, and itchy eyes. Dry air is just one part. Add all the natural factors that our skin is prone to in winter – harsh wind, rain, cold and perhaps even sleet and snow. The combined effect is that your skin becomes stressed-out and less able to maintain its natural balance – causing an increase in different skin issues like blemishes. There are many simple and effective methods helping dry skin to recover its balance. But sometimes inadvertently we deteriorate the skin ourselves. Hot showers, drying soaps or too much heat are just a couple of things that gradually adds up to all the different skin problems. Check the most common habits that should be better avoided in winter. When your skin is already sensitive due to the lack of humidity, using harsh cleansers will only serve to make things worse. These cleansers may work for you in the summer, but that doesn’t mean they’ll be good for every other season. Cleansers or makeup wipes with harsh alcohols as well as other irritating ingredients such as fragrance, essential oils (especially peppermint), menthol, and sodium laurel sulfate are better to be avoided. Instead, use a creamy cleanser or even an oil! The oil cleansing method is great for all skin types, including those with oily skin. Oils like argan, jojoba or almond oil do a great job of removing residual makeup, dirt, or grime, yet are totally calming and moisturizing on your skin. Foaming cleansers are best left to summer and spring months. While it may be tempting to exfoliate and get those dead skin cells out of the way, you’ll actually be damaging the barrier that keeps moisture in our skin if you exfoliate too much. Instead, limit your exfoliating to once per week, and make sure it’s mild. This applies to your face as well as your body. Chemical exfoliants are the way to go, particularly for your face. Glycolic/lactic acid are two recommended ingredients in chemical exfoliation products. Do not exfoliate anywhere that is cracked, bleeding, or hurting. A lot of people think they don’t need to use sunscreen in the winter. It’s so cold that we often forget that the sun is actually shining! Sunscreen is important year-round, whether it’s cloudy or sunny. It’s the number one best way to prevent wrinkles or sun damage to your skin. One thing you particularly need to look out for is to pile on the sun protection when doing winter sports. Winter sports are often practiced in high altitudes, where the sun is very strong. The temperature may be colder, but you can still very much get burned! While it may be tempting to just throw on a coat when you’re heading outside for an errand, bundling up could really help you not to dry out your skin. Using scarves, hats, gloves, and other proper winter gear will help shield your skin against the harsh winter wind. Not wearing soft undershirts under wool sweaters can make your skin worse. While warm and cozy, these items of clothing can further irritate your skin. Instead, pair it with a silk or cotton layer underneath. That way you can always peel off a layer to prevent overheating. As good as it may feel, it’s actually a mistake to crank that temperature up during the winter. We’re all about keeping our skin well-moisturized here — and scalding hot water will do the exact opposite. The natural oils that we rely on to keep our skin soft get washed away with high temperature water. We don’t expect you to take a cold shower, but what you can do instead is get in and out of that shower as fast as possible, using water as lukewarm as you can bare. A 5-minute shower will do much less damage than a 30-minute bath or shower. The same goes for washing your face and applying your skincare routine. What’s the point of applying all that moisturizer if you’re just going to dry out your skin with boiling hot water? When you wash your face, use lukewarm water. It will make your skin so much happier! Washing your hands is an excellent and essential sanitary practice, but in the winter it can feel like you are making your dry hands worse. Consider purchasing a gentle hand soap for winter that has moisturizing ingredients like aloe vera. Otherwise, you can alternate using soap and water and a gentle hand sanitizer. Carry around some travel-size hand sanitizer and moisturizer in your purse and/or keep them at your desk at work. The same advice applies to your shower gel and soaps as it does to your hand soap. Since your skin is far pickier in the winter, avoid deodorant soaps or harsh bar soaps. Non-foaming soaps are something to keep in mind if you have especially sensitive skin. Keep a mild soap in your shower during the winter and don’t forget to follow up with moisturizer. As you can imagine, intense heating can have the same effects as a hot shower. Is it really reasonable to wear a t-shirt in the winter anyway? Keep your house or apartment at a reasonable temperature and your skin will thank you. Don’t forget to make sure your house is well insulated so that none of that good warm air escapes! We often talk about our lips and hands in the winter, but let’s not leave our feet out of the equation. Dry feet are absolutely no fun for anyone. Keep your feet moisturized by doing moisturizing treatment: slap on some moisturizer and vaseline, put on some socks, and leave them overnight. You’ll wake up with baby soft feet! Note: If you seem to have chronically dry skin, consider getting your blood sugar checked. Untreated diabetes can cause very dry skin. Everyone has a different diet that works for them, but many agree that in the winter it’s especially important to maintain a healthy diet. Why? With the cold weather looming outside, it’s tempting to stay in and order lots of unhealthy takeout. Instead, cook warming and healthful foods full of lots of fiber, fatty acids, fresh fruit, green leafy vegetables, and drink plenty of water as usual. Make tasteful smoothies – they are full of vitamins and micro elements. Just remember: if you’ve been consuming alcohol or caffeine, up your water intake to make up for it to prevent dehydration. Pro tip: If you’re having skin issues, foods containing omega 3 fatty acids like (salmon, tofu, soybeans, orange juice) are great for your skin. This, in fact, should come first, as it is so important. Its relevant for your overall health and well-being, and skin is just a part of it. So, know your own limits, don’t forget to rest. Dark winter evenings are perfect for cozy laying at home, after all.